Will the new cat make friends with the other cats? For the past week, we've allowed Charlotte, the new cat, full access to the house. As mentioned last week, I gave up on following the advice of super slow introductions since Charlotte and the other cats are not fighting (just growling and hissing some). I keep wondering where (or if) all the cats will become friends! As the week went on, Charlotte gained more confidence and entered the kitchen on her own. Eventually, she also tested the cat towers in the living room (which is attached to the kitchen). She also is eating her wet food in the kitchen with the other cats. Charlotte is very demanding and meows loudly for her wet food. 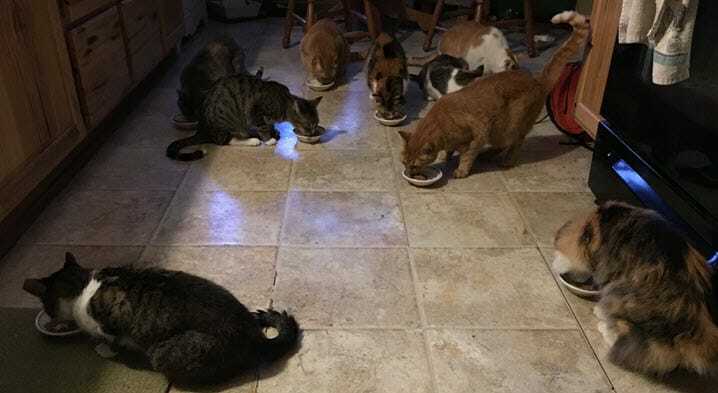 A few times she has lashed out at the other cats while waiting for her food bowl (it takes time to dish out 9 bowls!). I've been able to move the food bowl a bit closer together as well with less growling. 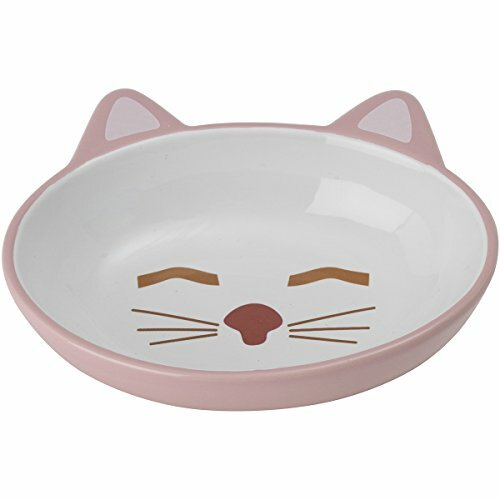 Once she is able to eat without growling at the others, she will be rewarded with a cat bowl that matches the Petrageous bowls that we have for each cat. We have pink for the females and gray for the males! The bowls in the picture above are not the Petrageous bowls. We got this set of 11 at a thrift store for only $2 or $3! As you can see, Charlotte is keeping her distance. If another cat gets too close she will hiss, growl and swipe at them! So, some of them are a bit afraid of her. Charlotte was at the vet this morning for her second round of vaccinations. I asked the vet about our integration plan. He said, "are you using a screen between them"? Ummm. No. I thought about the same advice in Jackson Galaxy's Cat Mojo book that I felt was too complicated to try. I explained that we had Charlotte (the new cat) separate from the other cats for a few weeks and then let her have access to the house. Since they are not fighting, the vet said this was okay and it might take 2-4 weeks from them to figure out where each cat stands. 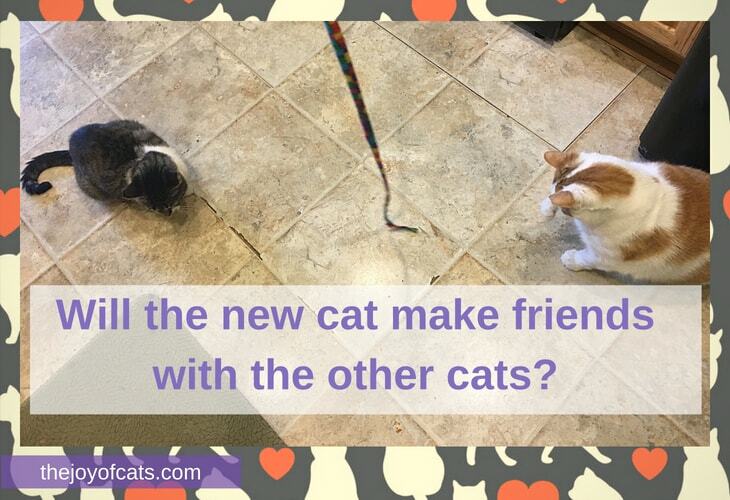 Jackson Galaxy suggests that new cat meetings be playful to avoid the cats staring at each other. I've been using wand toys in between the cats to keep them distracted. When Charlotte is on a cat tower (and the other cats aren't, but are close by), the wand toy is working as a distraction. She's also allowed Buster to get within a couple of feet without growling at him. This is a sign of progress! So, I will keep you updated! I have very ready for them to all be friends. Charlotte was living with 2 cats at her prior home, so I think she will come around. Update: I don't recommend this approach. Slower seems like the better approach! Have you tried this method of new cat integration? Did it work out eventually? 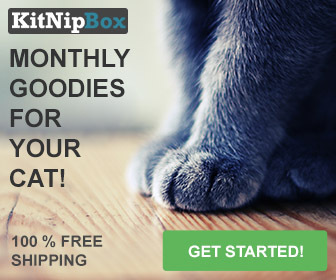 Sent every Saturday, Get The Caturday Newsletter: Cat Links, Tips, and More.